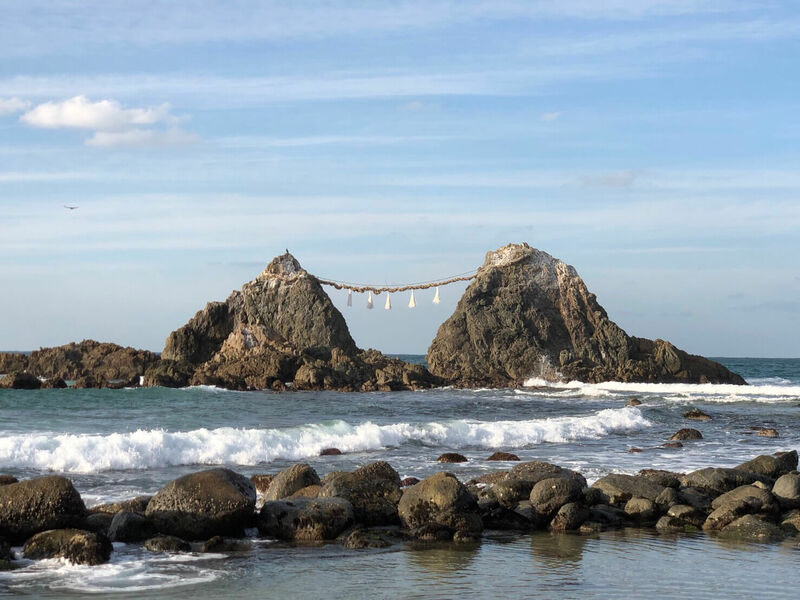 Itoshima is a city situated in the northwestern part of Fukuoka Prefecture that’s currently gaining rapid popularity as a location for great Instagram photos. It boasts many gorgeous locations surrounded by the sea and nature. It’s also packed full of local gourmet restaurants and eateries and is known as a hugely popular tourist spot particularly with Japanese women. We have compiled a list of recommended tourist spots for you to check out if you’re travelling to Fukuoka. Itoshima is about a 30-minute drive from central Fukuoka. The Itoshima Peninsula faces the Genkai Sea with the beautiful stretch of coastline graced by rich and plentiful nature. It’s here you will run into cafes sat against the radiant sunset, delicious food made with ingredients sourced in Itoshima, and many other things. This holy place is home to Sakurai Shrine, which has been designated by the prefecture as cultural property. It is popular for its beautiful sunset. During the summer solstice, people admire the setting sun between the twin rocks which makes for a picturesque and romantic scene. The photogenic palm tree swing of the Itoshima Peninsula looks out across the east coast. It’s a popular area that bustles in the summertime with BBQs and people swimming in the sea. The swing is free to use so people travel from all across the country to snap a photo on the swing for their Instagram pages. The London Bus Café is a cute iconic café with a colourful and cute European appearance. Many people take photos with the sea and blue sky behind them. As evening starts to set in in it’s easier to get backlighting, so if you’re looking for better photos it’s best to go early after midday. Once you’ve taken a photo you can relax in the café on the second floor. Suginoya is a sake brewery with a lot of history in Itoshima. It even won the gold award in an international beer festival. Their beer has a distinct mild and mellow flavour and is the representative local beer of Fukuoka in name and reality. Their most popular food item are their freshly made croissants which are a satisfying balance of crunchy outside and a fluffy and buttery outside. They also serve pizzas and sausages among other light meals making it a great lunch location. The angel’s wings are gathering much attention with Instagram girls in Japan right now. Look out for the shopping complex known as PALM BEACH THE GARDENS. After arriving there, head down onto the sandy beach in front of you. Look for the road opposite the sea and you’ll find the angel’s wings painted on the wall. The shopping center PALM BEACH THE GARDENS is decked out with a range of restaurants, cafes and general stores. It’s a place where you can look out across the beach while eating or enjoying yourself in a café. It’s a great spot to stop by once you’ve visited the angel’s wings and beach. This cafe is a regular stop-off for people driving around Itoshima. Located along Shima Sunset Road, CURRENT is popular for its Italian inspired food and atmosphere. It’s situated slightly high up meaning you get to enjoy a full ocean view from the terrace seats. Their lunch plates come with generous servings with amazing flavours. There are many cafés lining the coast in Itoshima but cafés actually on the beach are few in number. Bistro&Cafe TIME is stylish and has an open and spacious wooden deck terrace allowing for a relaxing café experience. Their authentic desserts looks so delicious you’ll find yourself reaching for your camera to snap a photo without realising. They have a lunch menu too. Did you enjoy this list? Make sure to take lots of wonderful photos if you visit Itoshima – there’s plenty of opportunities to do so!